Do you ever feel like you have too many balls in the air? Recently, I listed out all the projects that I was actively working on, and I came to a sobering realization. While I was in fact working on all of them, they were all moving forward at a glacial pace. For the last few months, I’ve been dividing up my day between all of these projects. That sounds good in theory, until you realize it has been two months since I’ve finished any of them. I thought I was being mature by scheduling one hour blocks to work on different types of projects every day. I would write for an hour, I would work on marketing stuff for an hour, I would set aside two afternoons per week to work on client projects. It looked really pretty on my calendar, but nothing was getting finished. So, I scratched everything but the three most important projects, and I’ve only been working on those for the last week. I’m making serious headway on all three of them. I’m finishing things I’ve been intending to do for weeks, even months. With only three balls in the air, I can keep my eye on all of them, and make them submit to me. Do you feel like you’re trying to do too much in your studio? If so, write down everything you are currently committed to, and see how many of them you can get rid of. Either get rid of them altogether, or put them on a list for later. Once you pare things down to the bare essentials, the most important projects, then put all your focus into finishing those. It sounds simple, I know, but it has made a profound impact on me in the last week. If you don’t have any projects to focus on, may I suggest one? 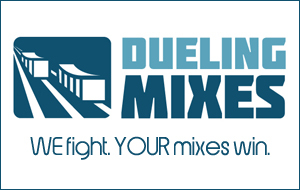 Become a member over at Dueling Mixes. You will receive the multi-track files for this month’s song plus two really great videos showing you how to mix the song.